These Combo is the best value-for-money option in our medium scale range and is widely used by farmers and entrepreneurs who seek to make an additional income from producing day old chicks. There is a very large and profitable market for day old chicks and with these machines you can now become a player in this highly lucrative market. These are the largest combo setter and hatcher egg incubator. 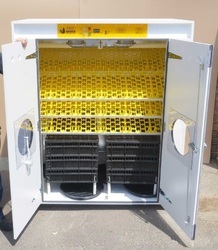 The output capacity of this will enable you to produce up to 1782 chicks per month or up to 8160 quail eggs.